It’s summer. It’s hot, but there are still birds that you should make time to see. There are presently two things to put on your summer ‘to-do’ list. Visit Huguenot Memorial Park. There are hundreds of nesting shorebirds. It is a sight to see when chicks start spilling onto the beach from the dunes. More importantly, sign up as a bird steward to help these vulnerable shorebirds. Volunteer bird stewards are needed right now at several locations, in particular at Huguenot Memorial Park. Weekends, especially long holiday weekends, can be disastrous for nesting shorebirds since the level of disturbance from people, pets, and vehicles is often higher than usual. Under these circumstances, signs posted around nesting areas may not be enough to keep them protected from disturbance; this is when bird stewards are especially important. During their volunteer shifts, bird stewards keep a watchful eye on nesting areas and work to minimize disturbances by educating beachgoers about these vulnerable shorebirds. 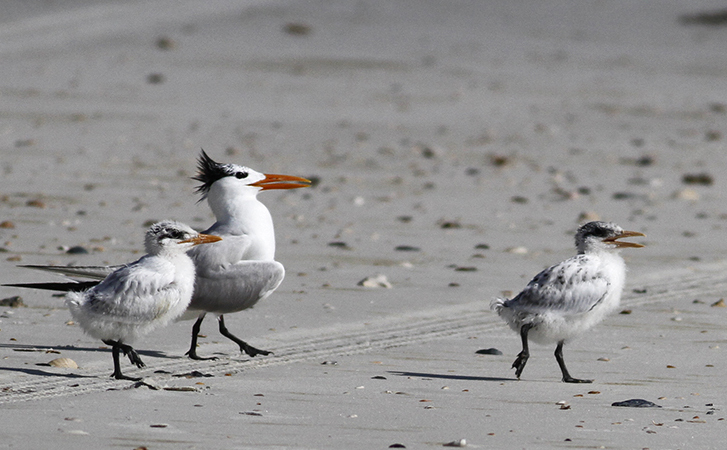 While doing this important work, bird stewards can also enjoy up-close-and-personal looks at the fascinating behaviors of these nesting birds plus have a fun day at the beach! 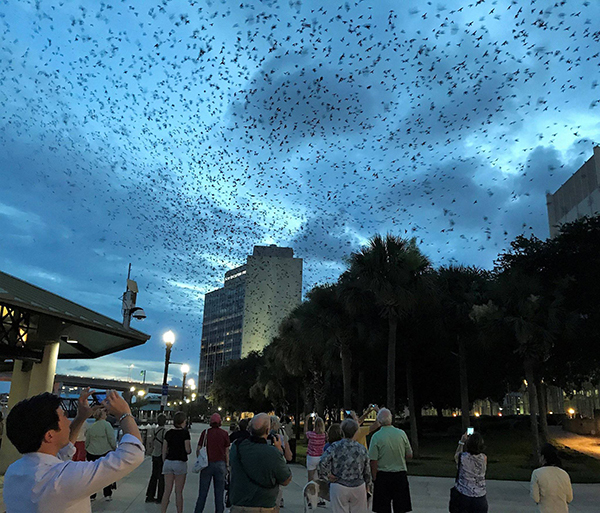 Visit the Riverwalk at the Jacksonville Landing on Hogan Street in downtown Jacksonville to see thousands of Purple Martins coming in to roost. Our Education Director, Brett Moyer, snapped this photo as some onlookers were enjoying the show on Wednesday. The birds are gathering in a pre-migratory roost each evening. The spectacle was covered in the Florida Times-Union recently. Click link to read: Purple Martins by thousands take flight downtown through early evening sky. The roosting should continue nightly for the next couple of weeks. We will be downtown on Sunday, July 2nd at 8 p.m., if the weather is cooperative for another Purple Martin watch so come on down and join us!